It's no secret that Kirby has been a huge part of Nintendo's portable systems over the years, even making his debut on the original Game Boy back in 1992. When Kirby Canvas Curse was released, it took the traditional button controls away and replaced them with the touchscreen controls of the DS. While some die-hard fans of the series didn't care for the change, it did present a rather unique gaming experience that showed just what the DS touchscreen controls were capable of. Now six years later, Kirby returns to the touchscreen and while the gameplay design is quite a bit different this time around, it actually makes for an even more engaging playing experience. When you begin the game, you're given one Kirby to work with. While this works quite well with the early tutorial sections, you'll soon find out that if you're going to get anywhere in this game you're going to have to do it with more Kirby at your disposal. The majority of the game still feels very reminiscent of past releases, but having to control the game entirely with the touchscreen does take a little getting used to. As the majority of your adventure will be spent with as many as 10 of the little pink fluffs, it's clear that this is a very different playing experience than most Kirby fans are used to. Moving around in Kirby Mass Attack is as simple as touching the stylus to the touchscreen. This will produce a gold star that your Kirby characters will follow. You can even double-tap on the screen to make them run, something you'll find quite useful in some of the trickier spots. If you need to give them specific movement directions, you simply tap on the group of Kirby characters and then draw a line to guide them on a direct path. There will also be times when you'll need to flick them at obstacles and enemies, which is executed with a mere flick of the stylus. You'll soon find that there are a huge number of control variations available to you as you experiment your way through the many levels. Many of the obstacles and challenges you'll face throughout your adventure revolve around how many Kirby characters you have on hand. Sometimes only a few are necessary to traverse tricky sections and take out specific enemies, whereas other times you're going to need as many as 10 to complete certain tasks. Items like plants that need to be pulled up often require more Kirby power, something you'll have to keep in mind as you make your way through the levels. If you find yourself lacking in number, all you have to do is gobble up fruit that becomes available after completing tasks and taking out enemies. There will even be times when you'll need to go back and revisit certain levels once you've accumulated a larger group of characters. The majority of the main adventure involves little more than making your way through the levels to an exit door at the end, all the while taking out the barrage of enemies and boss fights. Of course, if you want to experience everything the game has to offer, you'll need to locate and pick up the tiny gold medals that are carefully hidden around each level. With these medals you'll be able to unlock some amazing mini-games and other unique extras, like the music player, mini-RPG Kirby Quest and more. As if this weren't enough, there's also a list of 35 special tasks that function almost like achievements: trying to unlock and complete these tasks can be quite challenging, but prove to be extremely rewarding for those who take the time to perform them. It's impossible not to be impressed with how HAL Laboratories have implemented the touchscreen controls throughout the game. It's difficult to imagine that there are so many control variations that can be executed with such a simple means of control. Given that you do have to control a group of up to 10 Kirby, it can be a little tricky at times getting them all where they need to be, but for the most part the control scheme is top notch and does a fantastic job of making the game very playable, while still keeping things simple enough for players of all skill levels to enjoy. Kirby's first touchscreen outing took things visually in a radically-different direction, but thankfully things have returned to a more normal look in this release. Fans of the series will immediately feel right at home as many of the graphical influences from past releases make a return and look better than ever. Everything about the various world jump off the screen with their soft pastel colors and storybook feel, and even with all of the animation of the various enemies and multiple characters, the frame rate remains nice and smooth. Some gamers have begun to get a bit spoiled with the visual capabilities of the 3DS, but Mass Attack shows that the DS still packs some solid graphical punch when used effectively. The soundtrack features a huge amount of variety too: there's still the heavy dose of charming tunes we've all come to expect from a Kirby release, but this time around there are influences that include everything from jazz to country music and pretty much everything in between. There's even a good mix between slower, more melodic tunes to some of the more furious up-tempo tracks played out during the game's boss fights. To round out the package there is also a full range of cute Kirby sound effects that add even more charm to the overall package. 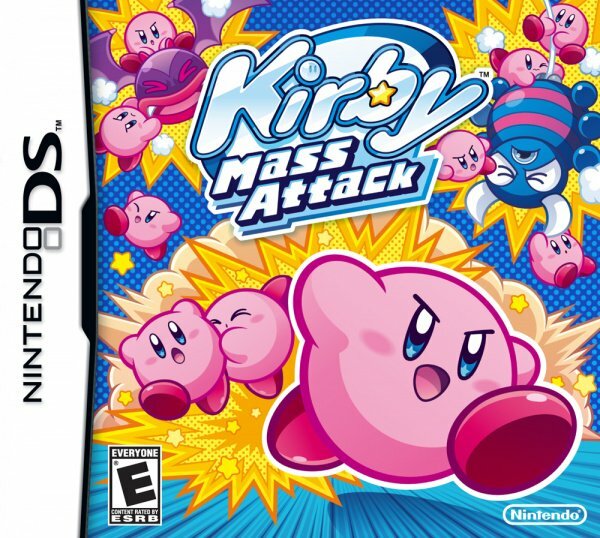 There will inevitably be Kirby purists who will baulk at the rather unorthodox gameplay concept behind Kirby Mass Attack, but if they do they'll be missing out on one of Kirby's most unique adventures to date. While there are a few extremely minor control issues that pop up from time to time, the touchscreen-only controls perform well, making the game an absolute joy to play. In truth, Kirby Mass Attack might very well be the closest thing to a Canvas Curse sequel we'll ever likely see and proves to be yet another extremely charming and engaging Kirby adventure. I wonder how good is the sound quality? The GBA and first two DS games' music kinda sucked compared to his SNES days. Game looks great, can't wait to play it. The Kirby series is ridiculously creative. I haven't played this, but I can say with some certainty that if you want to play something not quite like anything you've played before, this will do it for you. I knew this was going to be a good game since I tried the demo, it has a very unique and fun gameplay. Also the music and all those Kirbys running around make it more charming and enjoyable I'll get it as soon as I can. 9 for the price of one! I'm glad to see HAL taking Kirby into new, unique gameplay realms with this and Epic Yarn. Keep it up guys. Sounds and looks great. Good revw thanks. Revws generally good for this one so far. Touchscreen exclusive controls, eh? I'll pass then. I'm apparently one of the few people on Earth who hated/totally sucked at trying to navigate Canvas Curse. I don't think I ever even made it past the second stage in that one. it is coming but i had to order on amazon and its not coming today on release date. should be here within a week or so though. @Mully Did you try the demo. It's way easier to control than Canvas Curse. Great review! I really enjoyed the demo, so it's gotten added to my overly long wishlist. Can't wait, is an instant buy for me. Love Kirby! I'll be importing this from the US Pronto! I love me some Kirby action! I'm looking forward to grabbing a copy! Sounds nice from the review but Phantom Hourglass really burned me on touch-screen-only controls. I'm undecided. I see we are back to the US "Angry Kirby" cover to entice homophobic kids who fear pink as a "girly game" and want to be hardcorz. I didn't know this released so soon, so instant buy for me when I have money. @Mully: i'm with you, i'm disappointed to see this is another touchscreen-controlled Kirby title. i was hoping for something with traditional controls as an option. The demo was really fun, might pick this up later on. @MiracleBlaze You don't have to import, its out next month in Europe on the 28th October. Its not like its going to come out in EU a year after the American release like KSSU did. Why couldn´t they have released this game in Europe just a few days after the NA release but over a month later? That doesn´t matter anymore though since I´ve bought NA version from the internet already and waiting to get to play it. I really liked Touch! Kirby (that´s japanese name for Canvas Curse) a lot and wanted to see a sequel one day. This is not exactly what I´ve been waiting for but it does look very good. I played the demo (you can get it off the Nintendo Channel) and I loved this. I'm definately buying it for myself lol. Wasn't a fan of Epic Yam at all but this game should make up for it! Might get this if I got some spare money. The kirby series, more than any other, has more experimentation from game to game. So you never know what you are going to get. There is however amazing care taken by HAL with every one of them. So you pretty much can guarantee you are going to get something special with each Kirby release. I was very disappointed to find out that it didn't actually launch today. Ugh!I was really looking forward to this. Sounds like a great game, but probably won't pick it up since I'm covered with my brand new 3DS. I'm guessing this is probably the last worthwhile DS game to buy. Am I right? Really good review Corbs! I loved the demo so I was really looking forward to this game. I'll try and pick this up as soon as I see it in stores. Yes! It's the year of the kirby! When I saw the sub heading "Ten for the price of one", I thought that meant this was gonna be a 10. Touch screen only controls? I'm not sure how I feel about that. Phantom Hourglass and Spirit Tracks controlled fine for me. Tapping enemies to attack and "pulling" Link to control him was seamless and very fun. The early DS titles, however, (IE: Canvas Curse and Yoshi's Touch and Go) where you draw paths for a stationary character to roll on with little or no control as to what happens to them aside from drawing a line I found to be clunky, frustrating and boring. I think I might give the demo a shot if it's still available before I dismiss Mass Attack though. I feel like with the two Zeldas and a few other games, Nintendo perfected touch controlled games after those earlier hiccups. Really? I had absolutely no problems with Canvas Curse. In fact, I freaking loved that game. Hardly a "hiccup." Loved Canvas Curse, will be getting this. @Kobe1724 You're forgetting Professor Layton and the spectre's call. Seeing as Kirby CC/PP provided an actual game, it doesn't deserve to be lumped with that lame Yoshi tech demo. It was one of the few early DS games that i didn't regret buying and put the touch screen to good use (Meteos was another good one). Most of the other games that used the touch input were just gimmicky crap. I'll be buying this simply because it's from Hal Labs. I can't find this anywhere today! And this review is only whetting my appetite! For some reason companies still can't get on the same page and either release SHIP dates or RELEASE dates. We still get a steady dose of both, most of the time not knowing which is which. 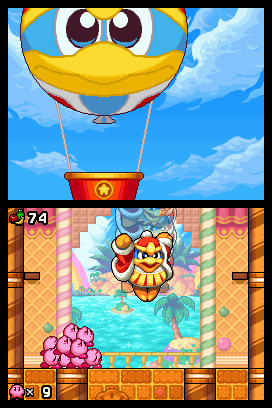 Kirby's had so many "unique" outings that unique is normal for him. Therefore it's not unique. Well written review, Corbs. Might check mass Attack out later down the road. Did anyone else think Mass Attack would've been the perfect fit for the iPhone? I guess your finger might obscure the playing field though. I hope we EU people will get a demo too. Nice review and nice score! When I first heard about this Kirby game I feared for a "Mini Mario affair". But soon It became clear to me this would be quite special. Looks and sounds like a pretty cool (and original) Kirby game. Nothing half-hearted from Nintendo's part at all! And that at the end of the DS lifecycle...I didn't expect it! This is my first non-forum post in a while! By the way, great review! I'll be sure to pick up the game when I can find it used. I played the demo, and might pick this up a couple years down the line. I allready have 3 Kirby games still unbeaten. Not that i stink, i just don't have the time. Five days later, and I've blasted through Mass Attack. Best Kirby game yet imo. It was good enough for me to bother to collect all 186 of the medals. 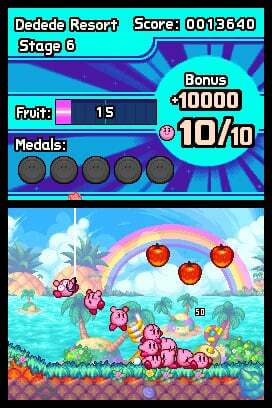 "Kirby's first touchscreen outing took things visually in a radically-different direction, but thankfully things have returned to a more normal look in this release"
Well, I still think it looks a little different from regular Kirby games (art-style wise). But that's not a bad thing! If you want a regular Kirby with regular (but very polished) Kirby graphics, go for Kirby's adventure Wii! Let's see... Kirby Squeak Squad, Kirby Canvas Curse, Kirby Superstar Ultra, and now this. Cool. This game looks so awesome. Oooh, ooh, I need this now. Since his debut on the Gamy Boy in 1992, Kirby's been the quintessential character for any genre, may it be platformers, puzzlers, fighting, racing, and even pinball and Arkanoid-style games. 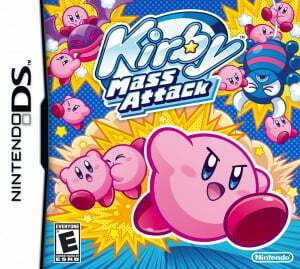 What better way for Nintendo and HAL Laboratory to deliver a DS swansong than with Kirby Mass Attack. I was expecting a Lemmings-style or Mario vs. Donkey Kong DS affair, but thankfully that wasn't the case. Controlling all 10 Kirbys at once is very challenging (especially when going for no-damage runs), but it’s a lot of fun once everything clicks. Even on the DS, the graphics are fantastic and it just feels good listening to the wonderful music. Nintendo and HAL Labs put so much effort into Mass Attack's minigames. My favorites are Kirby Brawl Ball, Strato Patrol EOS and Kirby Quest; be on the lookout for cameos of other Kirby characters! You have also a checklist featuring specific tasks to perform in the main adventure, which I find very rewarding. There’s so much to do in this game! 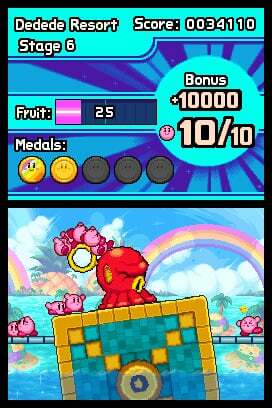 Kirby Mass Attack is a fantastic game that’s not to be missed! Excellent game. It really is. I downloaded the demo from the nintendo channel and the game is awsome i really like it when i get some money after chirstmas i'll buy it right now my chirstmas list/chirstmas eve list full!! It's an awesome game. little unsure about the only touch screen controls, though, other controls using the d-pad would be nice. Its still great anyway. the extras are also a fun way to distract yourself from the main story. Good review! @56... I agree with you 100%. Kirby has become the jack-of-all-trades in Nintendoland. If there are Kirby purists, they should retitle themselves as 'Kirby In Dreamland' purists, and take this game as a quintessential Nintendo DS game. This game is fun! Still need to beat it though. It's a good game, I'm a fan of the whole Kirby series, but the sound of Kirbys' screaming gets irritating very soon, other sound effects are also overly reused. It definitely lacks the sound quality of the other games and the graphics are a little jaggy (resolution/AA-wise) but the fun in the gameplay and storyline is there.